For the past 10 years, Grin City Collective has made its home in the community of Grinnell, Iowa, a vibrant, arts-focused city. 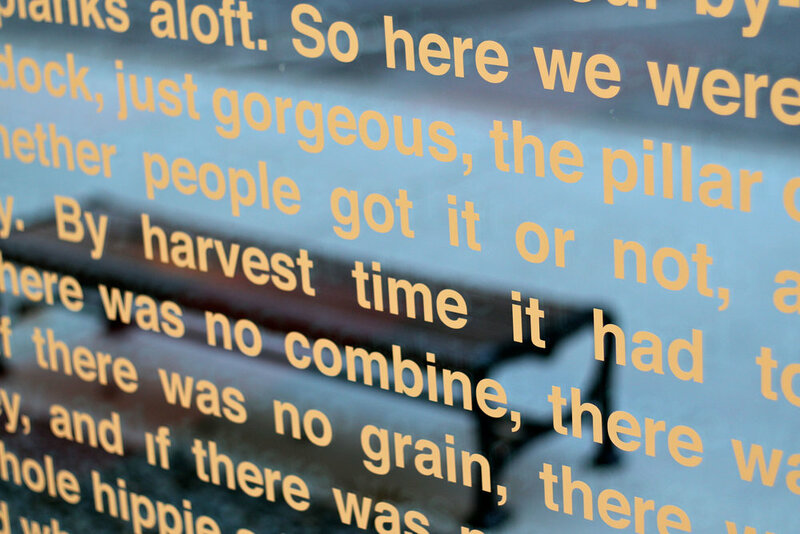 Yet very little public art exists in Grinnell's downtown area. To celebrate its tenth anniversary, Grin City is teaming up with the Grinnell Area Arts Council (GAAC) to commission 4 works of public art for our community. Thanks to the Iowa Arts Council's Public Art Network, more and more Iowans are able to stumble upon new works of contemporary visual art in public places, but there are fewer opportunities for the public to stumble upon new works of creative writing without the sometimes-intimidating commitment to opening the cover of a book. This limits the public's exposure to new authors and contemporary writing. Located at the Grinnell Arts Center and a Grin City outreach project, The Chime is a beacon and rallying cry for the support of the arts in Grinnell. The Chime is 10 foot x 10 inch, 200 pound tube of stainless steel, suspended in the air by 16 foot posts and a triangular support structure.